As of 2018, the Sahrawi Arab Democratic Republic has been recognized by 84 UN member states. Of these, 40 have "frozen" or "withdrawn" recognition for a number of reasons. Several states that do not recognise the Sahrawi Republic nonetheless recognize the Polisario Front as the legitimate representative of the population of the Western Sahara, but not as the government-in-exile for a sovereign state. The republic has been a full member of the African Union (AU), formerly the Organization of African Unity (OAU), since 1984. Morocco withdrew from the OAU in protest and remained the only African nation not within the AU between South Africa's admittance in 1994 and (re-)joining the African Union in 2017. The SADR also participates as guest on meetings of the Non-Aligned Movement or the New Asian–African Strategic Partnership, over Moroccan objections to SADR participation. On the other hand, upholding Moroccan "territorial integrity" is favoured by the Arab League. Besides Algeria, Mexico, Iran, Venezuela, Vietnam, Nigeria, and South Africa, India was the major middle power to have ever recognised SADR and maintained full diplomatic relations, having allowed the Sahrawi Arab Democratic Republic to open an embassy in New Delhi in 1985. However, India "withdrew" its recognition in 2000. As with any fluid political situation, diplomatic recognitions of either party's rights are subject to frequent and sometimes unannounced change. The Sahrawi Arab Democratic Republic has, since its proclamation established diplomatic relations with a number of states, mainly in Africa and Latin America, which have recognised its independence. In connection with the "freezing", "withdrawing" and resuming of recognition, similar changes have occurred at the level of diplomatic relations. SADR has stable and developed relationships with states such as Algeria and South Africa. A total of 39 states presently maintain diplomatic relations with the SADR. Of these, 32 have continuously maintained relations with SADR without any interruptions. As of 6 August 2018, Botswana is the most recent nation to have formally established diplomatic relations with the Sahrawi Arab Democratic Republic. Seven states have frozen or canceled relations with the SADR in the past, but later resumed them. As of 7 January 2016, Panama is the most recent nation that reestablished diplomatic relations with SADR. Cape Verde 30 September 1980 — — AU; Relations were frozen from 27 July 2007 to 6 February 2012 or shorter. On 10 July 2007 Prime Minister of Chad Delwa Kassiré Koumakoye received Sahrawi Foreign Minister Mohamed Salem Ould Salek. According to the communiqué, dated 17 July 2007 both parties decided to raise their diplomatic relations to ambassadorial level. 20 July was published Chadian objection to ignore protocol in Alwihda article where was written about Prime Minister signature of relations agreement. On the same place of Governmental web was published full text of comminiqué from 17 July 2007. It shows that Chadian objection to Alwihda article was mistakenly interpreted as a denial of diplomatic relations as such. On 11 August 2018 Sahrawi President expressed appreciation for the steadfast position of Chad in supporting the Sahrawi people's right to freedom and independence. El Salvador 1989[when?] Embassy, non-resident (Managua) Embassy, non-resident (New York City) Relations were cancelled from April 1997 to 6 June 2009 or shorter. Kenya 31 March 2006 Embassy (Nairobi) — AU; Relations were frozen from 18 October 2006 to 6 February 2014 or shorter. On 2 December 2013 Speaker of the National Assembly of Kenya Justin Muturi announced the opening of SADR embassy in Nairobi soon. On 11 December 2013 Sahrawi president Mohamed Abdelaziz officially visited Kenya for Independence Day celebrations. On 6 February 2014 Sahrawi embassy was open. Mauritius 1983[when?] Embassy, non-resident (Dar es Salaam) — AU; Relations are cancelled from 17 January 2014 to 23 November 2015. Nicaragua Yes[when?] Embassy (Managua) Embassy, non-resident (New York City) Relations were frozen from 21 July 2000 to 12 January 2007. Zambia Yes[when?] Embassy, non-resident (Dar es Salaam) — AU; Relations were cancelled from 29 March 2011 to 21 November 2012. According to Zambian sources, Foreign Minister Kabinga Pande received a bribe from Morocco for the MMD's 2011 election campaign and his personal re-election campaign in exchange for the "withdrawal" of recognition of the SADR. In July 2012 it was published, that the Michael Sata Government is in the process of recognising again the SADR as a sovereign state, as well as restoring the diplomatic relations. A total of 12 states or more [note 3] maintained official diplomatic relations with the SADR in the past. Their relations with SADR are now suspended, frozen or cancelled. As of 5 May 2017, Malawi is the most recent nation to formally cancel diplomatic relations with the Sahrawi Arab Democratic Republic. Burundi Yes[when?] — — AU; Relations were frozen from 5 May 2006 to 16 June 2008, they are cancelled from 25 October 2010. Colombia Yes[when?] — — Relations are frozen from 20 December 2000. Costa Rica Yes[when?] Embassy, non-resident (Panama City) — Relations are frozen from 22 April 2000. Guinea-Bissau Yes[when?] Embassy (Bissau) — AU, OIC; Relations are cancelled from 30 March 2010. Haiti 22 November 2006 Embassy (Port-au-Prince) — Relations are cancelled from 2 October 2013. India 1985 Embassy (New Delhi) Embassy, non-resident (Algiers) Relations are cancelled from 26 June 2000. Madagascar Yes[when?] Embassy (Antananarivo) — AU; Relations are frozen from 6 April 2005. Malawi 24 March 2002 Embassy, non-resident (Nairobi) Embassy, non-resident (Cairo) AU; Relations were cancelled from 27 December 2002 to 1 February 2008 and from 16 September 2008 to 6 March 2014 or shorter. They are cancelled again from 5 May 2017. In the past, Malawi had non-resident embassy (Cairo) in the SADR, later this embassy was not accredited to Sahrawi Republic. On 15 February 2012 SADR minister in charge of Africa was received by foreign minister of Malawi, on 6 March 2014 SADR ambassador presented credentials to president of Malawi. In 2014, Malawi embassy in Cairo was accredited to the SADR again. Paraguay 9 February 2000 Embassy, non-resident (Montevideo) — Relations were frozen from 25 July 2000 to 12 August 2008, they are suspended from 3 January 2014. Peru 5 May 1987 Embassy[where?] — Relations are frozen from 9 September 1996. The Ollanta Humala Government had a programme to restore relations with SADR. But diplomatic relations have not been restored. St. Vincent and the Grenadines 14 February 2002 Embassy, non-resident (Tindouf) — Relations are frozen from 15 February 2013. Seychelles Yes[when?] Embassy, non-resident (Antananarivo, then Algiers) — AU; Relations are cancelled from 17 March 2008. The Sahrawi Arab Democratic Republic holds either 'member' or 'observer' status in several international organisations. It participates in the activities of organisations that have formalised its membership, as well as in activities of other organizations as a guest participant. The SADR is usually represented by a Government or national organisations such as the Sahrawi Trade Union. African Union (AU; formerly Organization for African Unity) member Sahrawi Arab Democratic Republic 23 June 1980 31 August 1981 SADR representative is Vice President of the Pan-African Parliament (PAP) from May 2015.
International Union of Socialist Youth (IUSY) member Sahrawi Youth Union (UJSARIO) UJSARIO representative was one of IUSY Vice Presidents for 2012-2014. Central American Parliament (PARLACEN) participant[note 8] Sahrawi Arab Democratic Republic — — SADR participated in the opening conference of the PARLACEN, July 2010. Ibero-American Summit participant[note 8] Polisario Front — — Polisario Front participated in 22nd Ibero-American Summit in Cádiz, November 2012. New Asian–African Strategic Partnership (NAASP) participant[note 9] Sahrawi Arab Democratic Republic — — SADR participated in first senior officials meeting of the NAASP in Durban, September 2006. Non-Aligned Movement (NAM) guest[note 10] Sahrawi Arab Democratic Republic — — SADR participated as guest in 16th Summit of NAM in Tehran, August 2012. (COPPPAL) participant[note 8] Sahrawi Arab Democratic Republic — — SADR participated in COPPPAL meeting in Managua, September 2006. SADR delegation participated in meeting of COPPPAL and ICAPP in Mexico City, October 2012. Socialist International consultative member Polisario Front 30 June 2008 Admitted as observer member. Promoted to consultative member in 2017. The Sahrawi Arab Democratic Republic has signed a number of international treaties, conventions, protocols and charters negotiated in the context of the African Union. SADR participates in protection of human rights, common defense or trade liberalisation by signature of following agreements. African Continental Free Trade Agreement 21 March 2018 — A trade agreement between some African Union member states which will establish the African Continental Free Trade Area. Geneva Conventions 23 June 2015 Polisario Front made a unilateral declaration under Article 93.3 of Protocol I to apply the four Conventions and Protocol I in the Western Sahara conflict with Morocco. Polisario Front is not recognized as a party of Conventions, but declaration was accepted by the depositary of Convenions (Swiss Federal Council). Treaty Establishing the African Economic Community (AEC Treaty) 3 June 1991 25 August 1992 SADR signed to the AEC Treaty, but not participates in any of the AEC pillars. In 2015, the Sahrawi Arab Democratic Republic participated for the first time in the All Africa Games, the biggest African multi-sports event. African Union Sports Council member Sahrawi Ministry of Youth and Sports In September 2015, Sahrawi Republic participated in the 11th All Africa Games. N.F.-Board[note 11] provisional member Sahrawi Football Federation December 2003 In 2012, a Sahrawi team participated for the first time in the Viva World Cup hosted by Iraqi Kurdistan. ^ While ambassadors usually presented credentials to Sahrawi President in Camp Rabuni in Algeria, Cuban and Namibian ambassadors in March 2018 and Zimbabwean ambassador as third in May 2018 presented credentials to Sahrawi President in Liberated Territories of the SADR (in Bir Lehlou or Tifariti). ^ In May 2018, delegations represented by the ambassadors of Vietnam, Ecuador, Namibia, Cuba and South Africa and diplomats from Ethiopia, Uganda, Angola and Nigeria attended the festivities commemorating the 45th anniversary of the outbreak of the Sahrawi armed struggle in Tifariti, Liberated Territories. ^ a b The number of States which maintained diplomatic relations with SADR in the past is likely to be more, but for any relations with States that "withdrew" or "froze" recognition of SADR many years ago we are missing sources. ^ a b According to international law regarding recognition of states, contained in article 6 of the Montevideo Convention on the Rights and Duties of States: "Recognition of a state simply means that the state recognizes it accepts the personality of the other with all the rights and duties determined by international law. Recognition is unconditional and irrevocable". Therefore, once one state recognizes another as a fellow sovereign state, this recognition cannot be revoked, except when one or the other ceases to exist. One can only revoke the recognition of a government (for example by breaking off diplomatic relations), not of the state itself. ^ a b The number of former embassies which existed in the past is likely to be more, but for any embassies to/of states that "withdrew" or "froze" recognition of SADR many years ago we are missing sources. ^ The former embassies usually continue to work, but as a unilateral Representative Offices without diplomatic privileges from the host country. ^ In the framework of the Andean Parliament. ^ a b c There is not a formal status of the SADR, but here is the SADR official participation in the activities of this international organization. ^ NAASP does not have formalised membership, it is open to States of Asia and Africa. ^ There is no permanent guest status, but often several non-member states are represented as guests at NAM conferences. ^ N.F.-Board is defunct since January 2013. ^ a b "South Africa". ARSO - Association de soutien à un référendum libre et régulier au Sahara Occidental. 2006-09-09. Retrieved 2012-09-27. ^ South African Broadcasting Corporation (2006-09-01). "Asia-Afro partnership meeting kicked off today". South African Broadcasting Corporation. Archived from the original on September 29, 2007. Retrieved 2006-09-01. ^ "Arab League supports Morocco's territorial integrity". Arabic News. 1999-01-08. Archived from the original on 2012-09-07. Retrieved 2012-08-21. ^ "Arab League withdraws inaccurate Moroccan maps". Arabic News. 1998-12-17. Archived from the original on 2012-09-07. Retrieved 2012-08-21. ^ a b Punyapriya Dasgupta (2000-08-12). "Derecognition of Western Sahara". Economic and Political Weekly. "The government of India has decided, suddenly without any explanation, to withdraw the recognition granted in 1985 to the Sahrawi Arab Democratic Republic"
^ a b "La embajadora de Namibia para la RASD presenta sus credenciales al Presidente de la República en TT.LL". Sahara Press Service (in Spanish). 2018-08-03. Retrieved 2018-09-05. ^ a b "El Presidente de la República recibe en Tifariti las cartas credenciales del embajador de Zimbabwe". Sahara Press Service (in Spanish). 2018-05-21. Retrieved 2018-09-04. ^ "Strong presence of foreign delegations in 45th anniversary of Sahrawi armed struggle outbreak". Sahara Press Service. 2018-05-21. Retrieved 2018-11-11. ^ "Embajada de la RASD en Argelia" (in Spanish). Embajada de la RASD en Argelia. Retrieved 2012-11-14. ^ "Embaixadas em Angola - Embaixada Sahara Democratica" (in Portuguese). Portal da República de Angola. Archived from the original on 2012-11-08. Retrieved 2012-11-14. ^ "Sahrawi Arab Democratic Republic". Ministry of Foreign Affairs - Belize. Archived from the original on 2012-06-30. Retrieved 2012-03-15. ^ "Cinco nuevos embajadores presentaron cartas credenciales". El Diario (in Spanish). 2011-03-25. Retrieved 2012-03-16. ^ "Sahrawi Republic and Botswana establish diplomatic relations at ambassadorial level". Sahara Press Service. 2018-08-06. Retrieved 2018-09-03. ^ "Relações diplomáticas da República de Cabo Verde - África" (in Portuguese). Ministério das Relações Exteriores - República de Cabo Verde. Archived from the original on 2012-08-05. Retrieved 2012-03-15. ^ "Cabo Verde: Governo congela reconhecimento da República Árabe Saaraui Democrática". Angola News Agency (in Portuguese). 2007-07-27. Retrieved 2012-09-22. ^ "President meets with representative from Sahrawi Republic". A Semana. 2012-02-07. Archived from the original on 2013-12-03. Retrieved 2012-08-22. ^ "JCF recebe ministro dos negócios estrangeiros da RASD" (in Portuguese). Liberal. 2012-02-06. Retrieved 2012-10-03. ^ "President of Republic congratulates his Chadian counterpart on National Day". Sahara Press Service. 2018-08-11. Retrieved 2018-08-27. ^ "Cuba y la RASD celebran 30 años de relaciones diplomáticas" (in Spanish). Ministerio de Relaciones Exteriores de Cuba. 2010-01-05. Archived from the original on 2013-01-20. Retrieved 2012-03-17. ^ "Representaciones Diplomáticas y Consulares acreditadas en Cuba". Ministry of Foreign Affairs. Archived from the original on 2011-01-13. Retrieved 2011-02-20. "Embajada de la República Árabe Saharaui Democrática"
^ "Embajada de Cuba en Argelia, concurrencias en República Saharaui Democrática, República Islámica de Mauritania" (in Spanish). Ministerio de Relaciones Exteriores de la República de Cuba. Archived from the original on 2012-06-05. Retrieved 2012-03-16. ^ "On the establishment of diplomatic relations between East Timor and the SADR". ARSO - Association de soutien à un référendum libre et régulier au Sahara Occidental. Retrieved 2012-08-22. ^ "Fourth Committee Approves Five Consensus Texts Reaffirming Inalienable Right to Self-Determination and Independence". United Nations General Assembly. Department of Public Information • News and Media Division • New York. 2011-10-10. Retrieved 2012-03-23. Lisualdo Gaspar, Director of Bilateral Affairs, Ministry of Foreign Affairs of Timor‑Leste: "In fact, he added, Timor‑Leste had accorded full diplomatic representation to the Embassy of the "Saharawi Republic" in its capital, Dili, in 2010"
^ "Saharauis abren embajada en Ecuador" (in Spanish). Aeronoticias. 2015-09-29. Retrieved 2015-10-05. ^ "Peru: COPESA calls for restoring diplomatic relations with SADR". Sahara Press Service. 2015-10-05. Archived from the original on 2015-10-06. Retrieved 2015-10-05. "...appointment of the Saharawi diplomat... as the first resident ambassador in Quito, Ecuador"
^ "Ecuador appoints its UN permanent representative as ambassador to the Saharawi Republic". Sahara Press Service. 2011-09-21. Archived from the original on 2016-01-16. Retrieved 2012-03-16. ^ "Canciller Martínez apoya solución pacífica y negociada en el Sahara Occidental" (in Spanish). Ministerio de Relaciones Exteriores de El Salvador. 2010-11-29. Retrieved 2012-03-16. ^ a b c "States which recognize the SADR". ARSO - Association de soutien à un référendum libre et régulier au Sahara Occidental. 2009. Retrieved 2012-07-21. ^ "President of Republic ends his visit to El Salvador". Sahara Press Service. 2009-06-06. Archived from the original on 2010-04-11. Retrieved 2012-09-23. ^ Government of Ethiopia. "Embassy of the Sahrawi Arab Democratic Republic". Ministry of Foreign Affairs. Archived from the original on 2008-09-07. Retrieved 2012-03-15. ^ "Embassy of the Federal Democratic Republic of Ethiopia: Rome – Italy". Ethioembassy.org.uk. Archived from the original on 2006-09-25. Retrieved 2012-03-17. ^ "Six Ambassadors to Ghana present Credentials". Ghana Broadcasting Corporation. Archived from the original on 2012-07-15. Retrieved 2012-03-17. ^ "Sahrawi Ambassador presents his credentials to Ghanaian President". Sahara Press Service. 2011-09-09. Archived from the original on 2011-09-11. Retrieved 2012-03-17. ^ "Sahrawi Arab Democratic Republic to open mission here". Guyana Times. 2012-07-26. Archived from the original on August 5, 2012. Retrieved 2012-08-08. ^ "Lehbib Breika presents credentials as SADR ambassador to Guyana". Sahara Press Service. 2013-12-12. Archived from the original on 2015-05-09. Retrieved 2013-12-12. ^ "Foreign Affairs highlights in 2013…". Guyana Chronicle. 2014-01-06. Retrieved 2014-03-12. ^ "First Sahrawi Arab Republic Ambassador accredited". GINA (Government Information Agency). 2013-12-12. Archived from the original on 2013-12-14. Retrieved 2014-03-12. ^ "Guyana accredits first Sahrawi Arab Ambassador". iNews Guyana. 2013-12-11. Retrieved 2013-12-14. ^ "Non-Resident Ambassadors & High Commissioners to Guyana". Ministry of Foreign Affairs of Guyana. 2015. Archived from the original on 2015-11-19. Retrieved 2015-11-28. "Embassy of Republic of Sahrawi... Chacao, DC, Venezuela"
^ "La RASD y Honduras deciden establecer relaciones diplomáticas". Sahara Press Service (in Spanish). 2013-06-06. Archived from the original on 2014-04-16. Retrieved 2013-06-10. ^ "Comunicado conjunto" (in Spanish). Voz del Sahara Occidental en Argentina. Retrieved 2013-06-10. ^ a b Muniu Riunge (2007-02-25). "Kenya: Why Links with Sahrawi Were Shortlived". AllAfrica.com (The Standard). Retrieved 2012-03-14. ^ a b c "Opening of Saharawi embassy in Nairobi". Sahara Press Service. 2014-02-06. Archived from the original on 2014-02-22. Retrieved 2014-03-22. ^ Ramadhan Rajab (2014-02-07). "Sahrawi Republic opens embassy in Nairobi". The Star. Archived from the original on 2014-02-22. Retrieved 2014-02-09. ^ "Open an Embassy of the Sahrawi Republic soon in Kenya" (in Arabic). Elkhabar. 2013-12-02. Archived from the original on 2013-12-16. Retrieved 2013-12-12. ^ "Chairman of the Kenyan National Council affirms his country's support of the right of the Saharawi people to self-determination in accordance with the UN resolutions" (in Arabic). Algérie Presse Service. 2013-12-02. Retrieved 2013-12-12. ^ "Saharawi President participates in the festivities immortalized the fiftieth anniversary of the independence of the Republic of Kenya" (in Arabic). Algérie Presse Service. 2013-12-11. Retrieved 2013-12-12. ^ "President of Republic begins visit to Kenya for Independence Day celebrations (official)". Sahara Press Service. 2013-12-11. Archived from the original on 2015-04-02. Retrieved 2013-12-12. ^ "List of states with whom Lao has set up diplomatic relation since 1950". Lao embassy in Hanoi. Archived from the original on 2012-03-17. Retrieved 2012-03-15. ^ "Lesotho diplomatic missions - Lesotho Embassy in Kuwait". Embassy of the Kingdom of Lesotho in Ireland. Retrieved 2012-03-20. ^ a b "Indian And Spanish Ambassadors Present Letters of Credence To President Sirleaf". Ministry of Foreign Affairs of Liberia. 2012-10-24. Archived from the original on 2013-03-13. Retrieved 2012-11-18. ^ "The Diplomat -Newsletter- issue nº 7" (PDF). Republic of Mauritius - Ministry of Foreign affairs, Regional integration and International trade. July 2011. Archived from the original (PDF) on 2011-12-15. Retrieved 2012-02-15. Arvin Boolell: "Mauritius has consistently supported the right to self-determination and independence of the people of Western Sahara and entertains close diplomatic relations with the Saharawi Arab Democratic Republic (SADR) since 1983." ^ "Diplomatic Corps - Embassy of the Saharawi Arab Democratic Republic". Republic of Mauritius - Ministry of Foreign Affairs, Regional Integration and International Trade. Archived from the original on 2011-11-14. Retrieved 2012-03-23. ^ "Republic of Mauritius withdraws its recognition of the so-called SADR". TopWireNews.com. 2014-01-20. Retrieved 2014-03-22. ^ "Mauritius re-establishes diplomatic relations with SADR". SADR Permanent Mission in Ethiopia and African Union. 2015-11-23. Retrieved 2015-11-25. ^ "Las Relaciones México y la República Árabe Saharaui Democrática" (in Spanish). Embajada de la República Árabe Saharaui Democrática en México. Archived from the original on 2012-03-06. Retrieved 2012-03-22. ^ "Representaciones Diplomáticas acreditada en México - República Árabe Saharaui Democrática" (in Spanish). Secretaría de Relaciones Exteriores, México. Retrieved 2012-03-22. ^ "Misiones de México en el Exterior: Organización de las Naciones Unidas O.N.U." (in Spanish). Government of Mexico. 2015-12-16. Retrieved 2015-12-26. "Enlace con: ...República Árabe Saharaui Democrática..."
^ Government of Mozambique. "Missões Diplomáticas em Moçambique com Residência em Moçambique" (PDF) (in Portuguese). Ministry of Foreign Affairs. Archived from the original (PDF) on 2011-07-17. Retrieved 2011-03-10. "Embaixada do República Arabe Saharaui Democratica"
^ Government of Namibia. "Embassies and High Commissions: R - S". Ministry of Foreign Affairs. Archived from the original on 2011-07-04. Retrieved 2010-11-20. "Saharawi (Non-Resident) Embassy of the Arab Democratic Republic of Saharawi"
^ "Cuerpo Diplomático Residente en Nicaragua - Embajada de la República Arabe Saharaui Democrática (RASD)" (in Spanish). Ministerio de Relaciones Exteriores - República de Nicaragua. Archived from the original on 2012-02-08. Retrieved 2012-03-17. ^ "México, Cuba y Nicaragua acreditan embajadores ante la RASD". El País (in Spanish). 1981-03-03. Retrieved 2012-01-31. ^ "Nicaragua y la RASD establecen oficialmente relaciones diplomáticas" (in Spanish). Um Draiga (SPS). 2007-01-12. Archived from the original on 2011-09-16. Retrieved 2012-02-16. ^ "Foreign Affairs Minister congratulates his Nigerian counterpart". Sahara Press Service. 2015-11-20. Archived from the original on 2016-02-01. Retrieved 2016-01-26. ^ "Nigeria committed to August 14 Bakassi handover-President Yar'Adua". NigeriaFirst.org - Official Website of the State House, Abuja. 2008-07-25. Archived from the original on 2012-04-15. Retrieved 2012-03-23. ^ Michael Odigbe (2011-10-09). "Western Sahara: Independence Will Come For Its Oppressed People". Nigerian Observer. Archived from the original on 2012-07-13. Retrieved 2012-03-23. ^ "Bidding farewell to outgoing Ambassador of Nigeria to SADR". Sahara Press Service. 2016-01-25. Archived from the original on 2016-01-26. Retrieved 2016-01-26. ^ "DPRK Diplomatic Relations" (PDF). The National Committee On North Korea. 2015. Retrieved 2015-11-28. ^ "Nuevos embajadores presentan Cartas Credenciales" (in Spanish). Gobierno Nacional - República de Panamá. 2009-06-04. Archived from the original on 2012-03-07. Retrieved 2012-03-22. 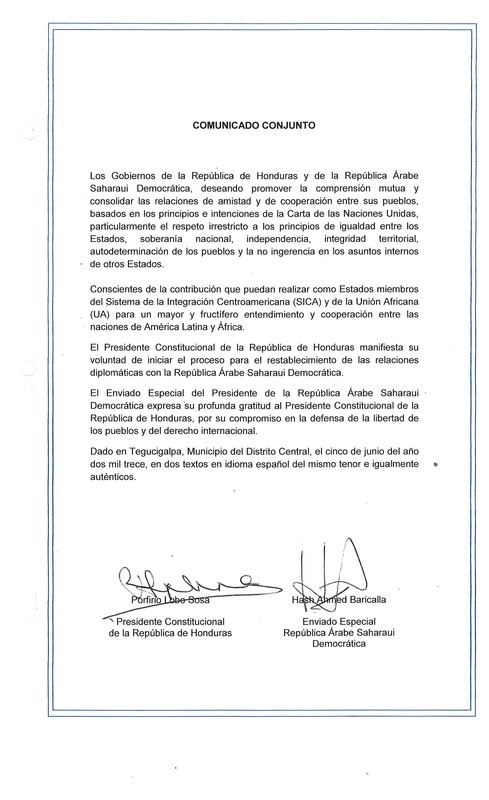 ^ "Declaración de suspensión de relaciones diplomáticas con la República Árabe Saharaui Democrática". Ministry of Foreign Affairs of Panama. 2013-11-20. Archived from the original on 2013-12-02. Retrieved 2013-11-22. ^ "Algeria: Sahrawi Embassy in Panama Reopens". AllAfrica. 2016-01-07. Retrieved 2015-01-13. ^ "President Kagame receives credentials of six new Ambassadors". Republic of Rwanda - Office of the president. 2011-12-06. Retrieved 2012-03-22. ^ "Special envoy brings President Koroma good message". State house - The Republic of Sierra Leone. 2011-06-20. Retrieved 2012-03-22. ^ "Bilateral agreements signed by South Africa between 01-01-1994 until 15-04-2011". Department of International Relations and Cooperation, Republic of South Africa. Retrieved 2012-11-15. "Saharawi Arab Democratic Republic - Joint communique on the establishment of diplomatic relations"
^ "Foreign Representatives in South Africa - Saharawi Arab Democratic Republic (Embassy of the Saharawi Republic)". Department: International Relations and Cooperation - Republic of South Africa. Retrieved 2012-03-23. ^ "Welcome to the Embassy of the Republic of South Africa in Algiers". SA Embassy in Algeria. Archived from the original on 2012-10-07. Retrieved 2012-11-15. "Embassy of the Republic of South Africa in Algeria also accredited to the Saharawi Arab Democratic Republic"
^ "Establishment of diplomatic relations between Republic of South Sudan and Saharawi Republic". Sahara Press Service. 2011-07-10. Archived from the original on 2012-04-15. Retrieved 2012-03-22. ^ "SADR takes part on eighth conference of the AU Population Commission". Sahara Press Service. 2011-09-17. Archived from the original on 2012-05-01. Retrieved 2012-03-22. ^ "Sahrawi". Ministry of Foreign Affairs - The Republic of Uganda. Archived from the original on 2012-03-15. Retrieved 2012-03-15. ^ "Message from the Ambassador". Embassy of the Republic of Uganda, Libya. Archived from the original on 2016-01-05. Retrieved 2012-03-20. ^ "Uruguay establece relaciones diplomáticas con país árabe - La Cancillería dio a conocer un Comunicado Conjunto sobre el establecimiento de relaciones diplomáticas entre la República Oriental del Uruguay y la República Árabe Saharaui Democrática" (in Spanish). Presidencia - República Oriental del Uruguay. 2005-12-26. Archived from the original on 2013-07-02. Retrieved 2012-03-20. ^ "Vanuatu and the Saharawi Republic establish diplomatic relations at Ambassadorial level". UPES. 2008-08-01. Retrieved 2012-03-20. ^ "Venezuela y la República Saharaui continúan cooperación bilateral" (in Spanish). Ministerio del Poder Popular para Relaciones Exteriores - Gobierno Bolivariano de Venezuela. 2010-04-28. Archived from the original on 2016-01-16. Retrieved 2012-03-22. ^ "Embajada en la República Argelina Democrática y Popular - Concurrencia: República Árabe Saharaui Democrática" (in Spanish). Ministerio del Poder Popular para Relaciones Exteriores - Gobierno Bolivariano de Venezuela. Archived from the original on 2016-01-16. Retrieved 2012-03-19. ^ "General Information about Countries and Regions". Ministry of Foreign Affairs of Vietnam. Retrieved 2013-08-25. ^ "Biography Ambassador Extraordinary and Plenipotentiary of the Socialist Republic of Vietnam in Algeria". Embassy of the Socialist Republic of Vietnam to the People’s Democratic Republic of Algeria. Archived from the original on 2017-12-01. Retrieved 22 November 2017. 5/2016: Nommé Ambassadeur plénipotentiaire et extraordinaire du Vietnam en République algérienne démocratique et populaire, République du Mali, ... et République arabe Sarahouie démocratique. ^ "Zambia withdraws recognition of 'Sahrawi Republic'". Middle East Online. 2011-04-03. Retrieved 2011-08-07. ^ "Zambia withdraws recognition of so-called SADR". Maroc.ma. Gouvernement Du Royaume Du Maroc. Archived from the original on 2013-02-19. Retrieved 2012-08-25. ^ "Zambia reafirma su apoyo al pueblo saharaui y a las relaciones con RASD". Sahara Press Service (in Spanish). 2012-11-21. Archived from the original on 2013-12-02. Retrieved 2012-11-27. ^ "Was Zambia bribed to withdraw recognition of Sahrawi republic". Zambian Watchdog. 2011-08-23. Retrieved 2012-08-20. ^ "Government to recognise Sahrawi". Zambia Online. 2012-07-07. Retrieved 2012-11-15. ^ "Announcement of the opening of an embassy for the Saharawi Republic in Zimbabwe". Sahara Press Service. 2011-09-17. Archived from the original on 2012-04-24. Retrieved 2012-03-22. ^ "New Sahrawi Ambassador presents his credentials to President of Zimbabwe". Sahara Press Service. 2011-09-09. Archived from the original on 2011-09-11. Retrieved 2012-03-19. ^ "Zim polls: No role for UK, EU". The Herald. 2012-09-09. Retrieved 2012-03-19. ^ "Burundi restablish diplomatic relations with the SADR". ARSO - Association de soutien à un référendum libre et régulier au Sahara Occidental. 2008-06-17. Retrieved 2010-06-09. ^ "Burundi withdraws recognition of 'SADR'". Maghreb Arab Press. 2010-10-25. Archived from the original on 2010-10-27. Retrieved 2012-09-22. ^ "Visite d'adieu d'Aziria Abdelkader, Ambassadeur algerien au Burundi" (in French). Républic de Burundi - Portail du Gouvernement. Archived from the original on 2013-03-13. Retrieved 2012-03-13. "Malgré le gel de la reconnaissance de la République Arabe de Sahraoui Démocratique, les relations entre les deux pays se sont nettement renforcées, a martelé l’Autorité burundaise." ^ "Saharauis piden a Colombia restablecer relaciones". El Tiempo (in Spanish). 2006-02-15. Retrieved 2015-11-28. ^ a b "Costa Rica reafirma decisión de congelar relaciones con República del Sahara". La Nación (in Spanish). 2000-06-05. Retrieved 2012-08-22. ^ "Relaciones con los países de Asia, África y Oceanía - X. República Árabe Democrática Saharaui" (PDF) (in Spanish). Asamblea Legislativa de la República de Costa Rica. Archived from the original (PDF) on September 27, 2011. ^ "El Sahara quiere descongelar relaciones con Costa Rica". La Nación (in Spanish). 2008-06-05. Retrieved 2012-08-22. ^ "Guinea Bissau withdraw its recognition of SADR and supports the autonomy initiative". ADN (in Spanish). 2010-03-30. Archived from the original on 2011-07-19. Retrieved 2012-09-22. ^ "Communique". Ministry of Foreign Affairs of Haiti. 2013-10-02. Retrieved 2013-10-15. ^ "Annual Report Jan 01, 1986". Ministry of External Affairs Library, New Delhi. Retrieved 2013-03-26. "Following our recognition of the Sahrawi Arab Democratic Republic (SADR) in October 1985, an SADR Embassy has started functioning in New Delhi." ^ a b "Embassies". GoAbroad. Retrieved 2012-11-15. ^ "Annual Reports 1987-88". Ministry of External Affairs Library, New Delhi. Retrieved 2013-03-26. "With the opening of the Embassy of the Saharawi Arab Democratic Republic (SADR) in Delhi, India's Ambassador to Algeria was concurrently accredited to the SADR." ^ "Recognition freeze". ARSO - Association de soutien à un référendum libre et régulier au Sahara Occidental. 2005-04-06. Retrieved 2012-08-26. ^ "Madagascar freezes recognition of so-called Sahrawi Republic". Arabic News. 2005-04-07. Archived from the original on 2013-12-03. Retrieved 2012-09-17. ^ "La RASD et le Malawi établissent des relations diplomatiques". Sahrawi Press Service (in French). 2002-03-25. Archived from the original on 2014-01-18. Retrieved 2013-08-26. ^ "Western Sahara Weekly News". Association de soutien à un référendum libre et régulier au Sahara Occidental. 2002-04-06. Retrieved 2014-03-22. ^ a b c "SADR ambassador presents credentials to President of Malawi". Sahrawi Press Service. 2014-03-06. Archived from the original on 2014-03-12. Retrieved 2014-03-11. ^ "Cyprus forecasts vibrant economy for Malawi". Malawi News Agency. 2014-03-07. Archived from the original on 2014-03-12. Retrieved 2014-03-11. ^ "New Zealand to promote netball in Mw". Malawi Broadcasting Corporation. 2014-03-07. Archived from the original on 2014-03-12. Retrieved 2014-03-11. ^ a b "Malawi diplomatic missions abroad" (PDF). Ministry of Foreign Affairs and International Cooperations of Malawi. 2014-12-02. Archived from the original (PDF) on 2014-12-10. Retrieved 2014-12-08. ^ "Western Sahara Weekly News". Association de soutien à un référendum libre et régulier au Sahara Occidental. 2002-12-28. Retrieved 2013-08-26. ^ "The Saharawi Republic and Malawi establish diplomatic relations". 2008-02-02. Retrieved 2012-08-16. ^ "Sahara issue: Malawi withdraws its recognition of the so-called SADR". Maghreb Arab Press. Archived from the original on February 4, 2011. Retrieved 2011-08-07. ^ "Sahara issue: Malawi withdraws its recognition of the so-called SADR". Actualités&Revue De Presse Maghreb. 2008-09-16. Archived from the original on 2013-02-19. Retrieved 2012-09-22. ^ "The Republic of Malawi withdraws its recognition of the so-called sadr". Ministry of Foreign Affairs and Cooperation (Morocco). 5 May 2017. Retrieved 12 May 2017. ^ "Malawi Embassies Abroad - Accreditation Arrangement of Malawi's Diplomatic Missions". Ministry of Foreign Affairs - Malawi. 2010-04-19. Archived from the original on 2011-02-16. Retrieved 2012-03-23. ^ "Jurisdiction". Embassy of Malawi - Cairo. Retrieved 2014-03-23. ^ "Minister in charge of Africa received by foreign Minister of Malawi". Sahrawi Press Service. 2012-02-15. Archived from the original on 2013-12-02. Retrieved 2014-03-23. ^ "Paraguay y República Árabe resuelven impulsar relaciones bilaterales". La Nación (in Spanish). 2011-08-19. Archived from the original on 2014-01-04. Retrieved 2012-03-15. ^ "Paraguay y República Árabe estrechan relaciones bilaterales". ABC Digital (in Spanish). 2011-08-19. Retrieved 2012-03-15. ^ "Embajada de la República Árabe Saharaui Democrática" (in Spanish). Ministerio de Relaciones Exteriores - Paraguay. Archived from the original on 2012-10-09. Retrieved 2012-11-15. ^ "Paraguay and the Saharawi Republic resume diplomatic relations (Paraguayan Minister)". Sahara Press Service. 2008-08-12. Archived from the original on October 25, 2008. Retrieved 2010-06-09. ^ "Declaración del Ministerio de Relaciones Exteriores" (in Spanish). Ministerio de Relaciones Exteriores - Paraguay. 2014-01-03. Retrieved 2014-03-22. ^ "Paraguay suspende relación con Saharaui" (in Spanish). ABC color. 2014-01-04. Retrieved 2014-03-26. ^ a b Ricardo Sánchez Serra (2011-11-28). "Los saharauis y el Perú" (in Spanish). Retrieved 2012-11-15. ^ Ricardo Sánchez Serra (2008-12-11). "El estoicismo del pueblo saharaui" (in Spanish). La Razón. Retrieved 2012-11-15. ^ "Agenda del Ministro" (in Spanish). Ministerio de Relaciones Exteriores del Perú. 2011-08-26. Archived from the original on 2012-04-05. Retrieved 2012-04-24. ^ "Andino Parliament for re-establishment of diplomatic relations between Peru and SADR". Sahara Press Service. 2011-11-19. Archived from the original on 2015-05-09. Retrieved 2012-11-15. ^ "Joint Statement: Recognition of the SADR by the Government of St. Vincent and The Grenadines". ARSO - Association de soutien à un référendum libre et régulier au Sahara Occidental. Retrieved 2012-11-15. ^ "Diplomatic missions accredited to Saint Vincent and the Grenadines" (PDF). Government of St. Vincent and the Grenadines. Archived from the original (PDF) on 2014-04-17. Retrieved 2014-04-16. "Sahrawi Arab Democratic Republic, C/o Ministry of Foreign Affairs of the Saharawi Arab Democratic Republic"
^ "Ambassadors/High Commissioners-Designate". Government of St. Vincent and the Grenadines. 2014. Archived from the original on 2014-04-16. Retrieved 2014-04-16. "Sahrawi Arab Republic, H. E. Mr. Abd Mohamed Yahia, Ambassador"
^ "Saint Vincent and the Grenadines freezes recognition of pseudo "SADR"". Morocco World News. 2013-02-15. Retrieved 2013-08-20. ^ "Boletín informativo. Año 2. Mayo 1997. Nº 9 - Presentación de Cartas Credenciales" (in Spanish). ARSO - Association de soutien à un référendum libre et régulier au Sahara Occidental. May 1997. Retrieved 2012-12-01. ^ "Diplomatic missions accredited to the Seychelles". Ministry of Foreign Affairs of the Republic of Seychelles. Retrieved 2012-12-01. ^ "Seychelles withdraws recognition for SADR". AfrikNews. 2008-03-18. Retrieved 2011-08-07. ^ Aguirre, Diego; Ramón, Jose (1991). Guerra en el Sáhara. p. 242. ISBN 84-7090-252-0. "On June 23 the Sahrawi Republic had applied for its admission to the O.U.A., as because of the successive recognitions of African countries, 26 of 50 members recognized the S.A.D.R. and were favorable to the admission in accordance to article 28 of the O.U.A. Charter, that demanded a simple majority." ^ Aguirre, Diego; Ramón, Jose (1991). Guerra en el Sáhara. p. 247. ISBN 84-7090-252-0. "on August 31 General Secretary Edem Kodjo had communicated the Sahrawi Arab Democratic Republic government their admission to the Organization for the African Unity as member nº 51 according to article 28 of the O.A.U. Charter, as 26 states supported the S.A.D.R., representing a simple majority over 50 so it was, then, a mere administrative proceeding competence of the General Secretary"
^ "PAP Elects New Second Vice President" (PDF). Pan-African Parliament. 2013-05-13. Archived from the original (PDF) on 2013-11-13. Retrieved 2013-05-27. ^ "Members". Committee of Intelligence and Security Services of Africa (CISSA). Retrieved 2015-07-01. ^ "Sahrawi Republic attends the Twelfth Conference of African security services and intelligence". Sahara Press Service. 2015-06-10. Archived from the original on 2015-07-01. Retrieved 2015-07-01. ^ "members of ICAED". International Coalition against Enforced Disappearances. Retrieved 2016-01-23. ^ "New IUSY Presidium 2012-2014". IUSY. Archived from the original on 2013-09-26. Retrieved 2012-04-25. ^ "Saharawi Lawyers' Union takes part in Pan-African Lawyers Union Triennial General Assembly and Conference in Yaounde". Sahara Press Service. 2014-06-08. Archived from the original on 2014-07-14. Retrieved 2014-06-11. ^ "Pan African Lawyers Union affirms support for Sahrawi people's right to self-determination". Sahara Press Service. 2014-06-10. Archived from the original on 2014-07-14. Retrieved 2014-06-11. ^ "African Member Organizations". World Federation of Democratic Youth. 2015. Retrieved 2015-01-25. ^ "Report on the World Trade Union situation and WFTU activities since the 14th congress". World Federation of Trade Unions. 2005-12-01. Retrieved 2012-11-15. "New affiliations with the WFTU - No.12, Western Sahara, UGTSARIO"
^ "SADR partakes, without any complex, in AU-EU Summit". Sahara Press Service. 2017-11-30. Retrieved 2017-10-12. ^ "5th AU-EU Summit: SADR's participation, "victory for Sahrawi people"". Sahara Press Service. 2017-12-01. Retrieved 2017-10-12. ^ "Venezuela es invitada por el Parlamento Andino a volver a la Comunidad Andina" (in Spanish). Parlamento Andino. 2011-10-14. Archived from the original on 2011-12-16. Retrieved 2012-03-10. ^ "Saharawi National Council granted observer membership in the Andino Parliament". Sahara Press Service. 2011-10-29. Archived from the original on 2015-05-09. Retrieved 2012-03-10. ^ "Polisario Front calls on Ibero-American states to help settling Western Sahara conflict". Sahara Press Service. 2012-11-17. Archived from the original on 2015-05-09. Retrieved 2012-12-10. ^ "Building a life in the desert" (PDF). Refugee Participation Network. Refugee Studies Program. February 1990. pp. 18–21. Retrieved 2012-11-16. "The Sahrawi Red Crescent has observer status with the League of Red Cross Societies and is the formal channel for all external assistance to the Sahrawi people, (full membership is precluded until SADR has gained membership of the United Nations)." ^ Aguirre, Diego; Ramón, Jose (1991). Guerra en el Sáhara. p. 176. ISBN 84-7090-252-0. "...in April the Sahrawi Red Crescent obtained the status of observer at the IX Congress of the Arab Red Crescent, analog to the International Red Cross, what supposed also the boycott of this reunion by Morocco." ^ "Asia-Afro partnership meeting held in Durban". IOL news. 2006-09-01. Retrieved 2010-12-11. ^ "Latin America". ARSO - Association de soutien à un référendum libre et régulier au Sahara Occidental. September 2006. Retrieved 2012-12-10. ^ "Participants". Progressive Alliance. Archived from the original on 2015-03-02. Retrieved 2014-12-08. ^ "Socialist International makes Polisario observer". The Daily Star. Agence France-Presse. 2008-07-03. Retrieved 2012-11-16. ^ "Polisario Front becomes consultative member of Socialist International association". Sahara Press Service. 2017-03-04. Retrieved 2018-11-11. ^ "List of countries which have signed, ratified/acceded to the African Charter on Democracy, Elections and Governance" (PDF). African Union. 2017-06-17. Retrieved 2017-12-02. ^ "List of countries which have signed, ratified/acceded to the African charter on human and people's rights" (PDF). African Union. 2010-02-04. Archived from the original (PDF) on 2013-05-09. Retrieved 2014-04-17. ^ "List of countries which have signed, ratified/acceded to the African Charter on the Rights and Welfare of the Child" (PDF). African Union. 2010-03-01. Archived from the original (PDF) on 2013-09-09. Retrieved 2014-04-17. ^ "List of countries which have signed, ratified/acceded to the African Charter on Values and Principles of Public Service and Administration" (PDF). African Union. 2017-06-15. Archived from the original (PDF) on 2017-12-02. Retrieved 2017-12-02. ^ "List of countries which have signed, ratified/acceded to the Agreement establishing the African Continental Free Trade Area" (PDF). African Union. 2018-08-08. Retrieved 2018-11-11. ^ "List of countries which have signed, ratified/acceded to the African nuclear-weapon-free zone treaty" (PDF). African Union. 2010-08-27. Archived from the original (PDF) on 2013-09-09. Retrieved 2014-04-17. ^ "List of countries which have signed, ratified/acceded to the African Convention on Preventing and Combating Corruption" (PDF). African Union. 2010-08-06. Archived from the original (PDF) on 2014-02-21. Retrieved 2014-04-17. ^ "List of countries which have signed, ratified/acceded to the AU Convention for the protection and assistance of internally displaced persons in Africa" (PDF). African Union. 2010-08-06. Archived from the original (PDF) on 2013-09-09. Retrieved 2014-04-17. ^ "List of countries which have signed, ratified/acceded to the AU Non-aggression and common defence pact" (PDF). African Union. 2010-03-28. Archived from the original (PDF) on 2015-09-23. Retrieved 2014-04-17. ^ "List of countries which have signed, ratified/acceded to the Convention of the African Energy Commission" (PDF). African Union. 2010-02-03. Archived from the original (PDF) on 2013-09-09. Retrieved 2014-04-17. ^ "Polisario Front becomes party to Geneva Conventions, launches solemn appeal to companies operating in Western Sahara". Sahara Press Service. 2015-06-28. Archived from the original on 2015-07-03. Retrieved 2015-07-02. ^ "Unilateral declaration pursuant to Article 96, paragraph 3, of Protocol I" (PDF). Federal Department of Foreign Affairs of Switzerland. 2015-06-26. Retrieved 2015-06-30. ^ "Autorité ayant fait la déclaration unilatérale prévue à l'article 96, paragraphe 3" (PDF). Federal Department of Foreign Affairs of Switzerland. Retrieved 2015-06-30. ^ "List of countries which have signed, ratified/acceded to the OAU Convention on the prevention and combating of terrorism" (PDF). African Union. 2010-02-03. Archived from the original (PDF) on 2013-09-09. Retrieved 2014-04-17. ^ "List of countries which have signed, ratified/acceded to the Protocol on the Statute of the African Court of Justice and Human Rights" (PDF). African Union. 2010-06-15. Archived from the original (PDF) on 2017-12-02. Retrieved 2017-02-12. ^ "List of countries which have signed, ratified/acceded to the Protocol to the African Charter on Human and Peoples' Rights on the Establishment of an African Court on Human and Peoples' Rights" (PDF). African Union. 2010-08-06. Archived from the original (PDF) on 2013-09-09. Retrieved 2014-04-17. ^ "List of countries which have signed, ratified/acceded to the Protocol to the African Charter on Human and Peoples' Rights on the Rights of Women in Africa" (PDF). African Union. 2010-07-22. Archived from the original (PDF) on 2013-09-14. Retrieved 2014-04-17. ^ "Treaty establishing the African Economic Community" (PDF). World Bank. Retrieved 2014-04-17. ^ "List of countries which have signed, ratified/acceded to the Treaty establishing the African Economic Community" (PDF). African Union. 2010-02-04. Archived from the original (PDF) on 2013-09-09. Retrieved 2014-04-17. ^ "Global Preferential Trade Agreements Database". World Bank. 2010. Retrieved 2014-04-17. ^ "11th All Africa Games". Association of National Olympic Committees. 2015-03-31. Archived from the original on 2015-07-08. Retrieved 2015-07-07. ^ "SADR participates in preparatory meeting of African Games in 2015". Sahrawi Press Service. 2015-03-01. Archived from the original on 2015-07-07. Retrieved 2015-07-07. ^ "Historical participation of Western Sahara in Africa Games". Equipe Media. 2015-01-20. Retrieved 2015-07-07.